Hartford Courant: Give the people what they want - & a little something extra - in Milford. Just as the aspiring novelist might be counseled to "write what you know," the aspiring entrepreneur might be urged to "do what you know." It only makes sense that Kay Ghura — born to a Syrian mother and a Chilean father, who worked for years in the Spanish embassy in Syria — would wind up opening a bagel shop and eventually a tapas joint. A Connecticut resident for the past two decades, Ghura owned popular Village Bagel in Milford for 13 years before moving down and across the Post Road into handsomer quarters and opening Village Bistro. For more than a dozen years, there was Village Bagel, an extremely popular breakfast and lunch stop on the Boston Post Road in Milford. But its owner, K Ghura, envisioned something greater. He moved his operation across and down the street into much improved quarters, retained his breakfast and lunch offerings, and added a Spanish-inspired menu of tapas and main dishes in the evening. Of Ghura’s own devising, the improved quarters include lovely design details, incorporating everything from old doors to wheels to drift wood. There’s a lovely patio, nice bar and beautiful dining room. Even the bathrooms are special, with old sewing machines turned into sink supports. And the staff is super nice—in my experience, that starts at the top. There is something so Comforting about a bistro. Perhaps it's the bistro's origin that reminisces the "at home" feel—locals extended their homes and opened their kitchens to hungry passersby for extra income. 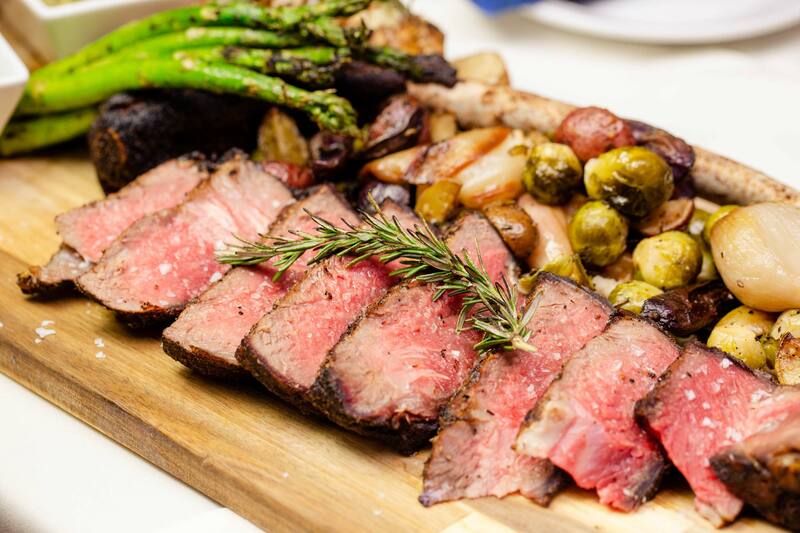 The cooking is famously rustic and home-style, offering moderately priced meals in a modest setting. 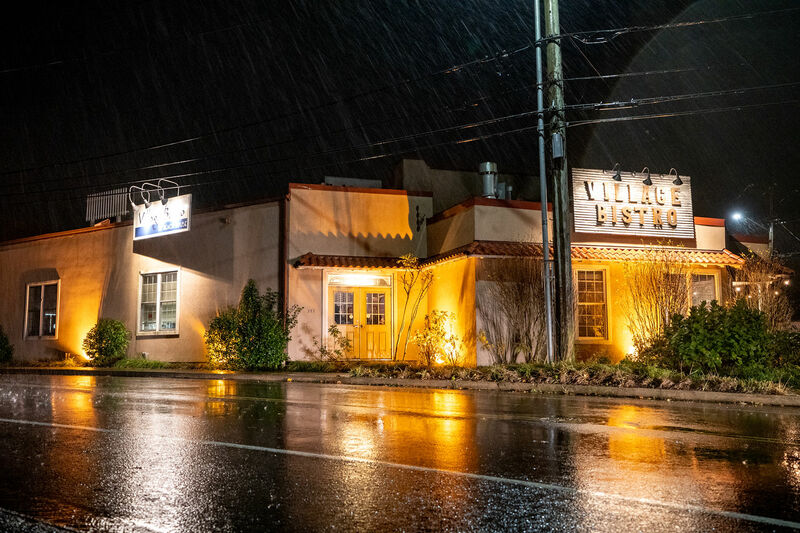 From its humble origins, the bistro has been elevated and celebrated as a source of great flavor profiles and cooking styles, and Village Bistro proudly continues this storied tradition. Diners, don't let the unusual location daunt you. Though oddly wedged between two incongruous Post Road businesses, Village Bistro is no less a portal to a European getaway. All things imported dominate the dark wood decor, like the long bar beckoning newcomers to join the village. 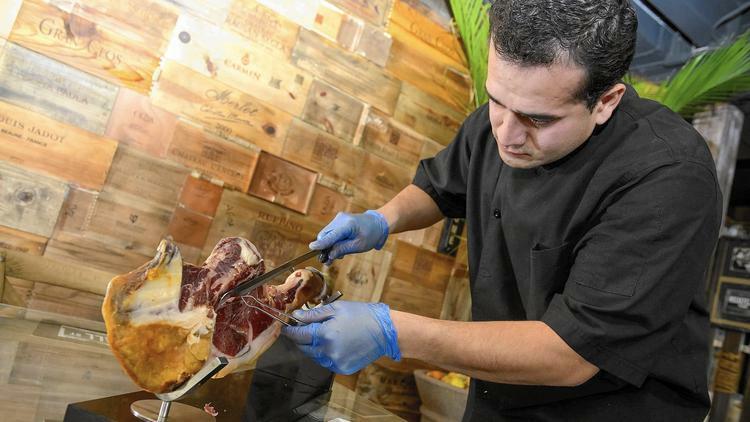 A 3-foot tower of Spanish olives, a leg of Jamon Iberia), both confirm the Milford to Madrid connection. Antique chalkboards further entice, featuring tapas of the day-very autentico. Visionary restaurateur Kay Ghura is the man behind the design, and his passion shines into every corner of the cozy space that he custom designed himself. 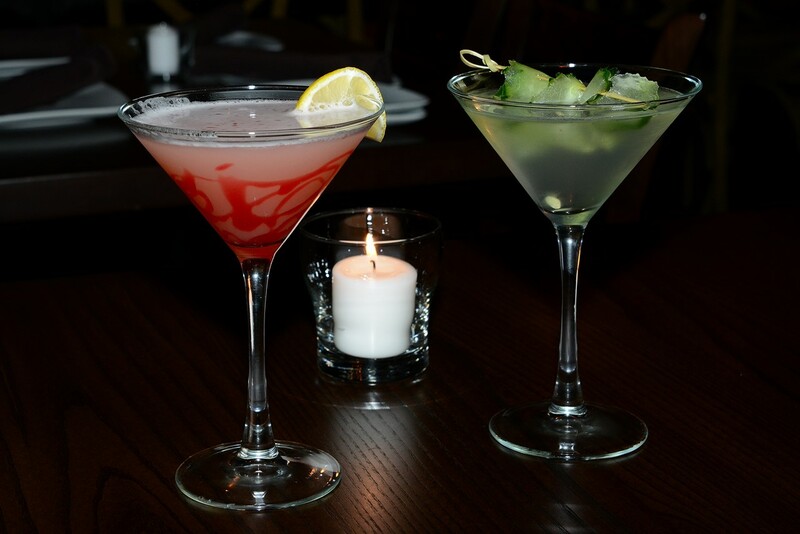 Argentina-born Khaled Ghura opened The Village Bistro, 1501 Boston Post Road, last September. Not only can you enjoy their authentic foods but on weekends they have flamingo dancers performing for your entertainment. The Bistro is decorated in a European design, dark-wooded tables and comfortable chairs, leather booths, beamed ceilings, and dark brown tiled floors. A massive antique Spanish door separates the 25-person-capacity bar area from the dining area. We admired the crystal chandelier, which is enclosed in a wrought iron cage against a wall of wine and beer crates. Our waiter, Evan, helpfully explained the varieties of food listed on their menu including hot Tapas and Empanadillas made with seasoned ground pork, goat cheese wrapped in a prosciutto ham and cranberry. Other items included: shrimp scampi sautéed with garlic and bistro spices, blackened flank steak, and scallops. Village Bistro, All rights reserved.